Our intent in this JV Landbird Habitat Conservation Strategy is to establish explicit regional objectives and to enhance planning effectiveness by applying available survey data and new technological tools. We establish a scientific process for objective setting and identified assumptions and research needs to improve subsequent iterations of the strategy. 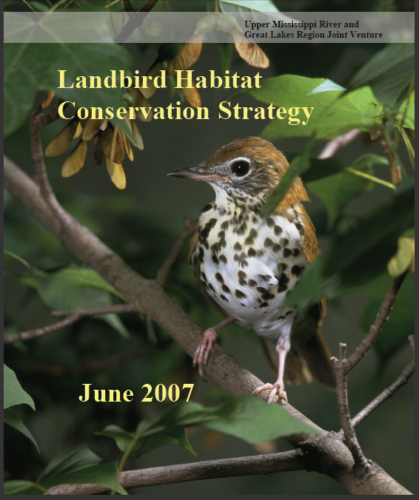 This plan is a “living document” that will be refined periodically as knowledge of regional landbird conservation improves and new spatial data becomes available and can be incorporated. Recommended citation: Potter, B. A., G. J. Soulliere, D. N. Ewert, M. G. Knutson, W. E. Thogmartin, J. S. Castrale, and M. J. Roell. 2007. Upper Mississippi River and Great Lakes Region Joint Venture Landbird Habitat Conservation Strategy. U.S. Fish and Wildlife Service, Fort Snelling, MN. 124pp.